Right now, Sickness is increasing at an alarming rate and solutions decreasing. More and more people are turning towards a holistic approach so as to combat these grave problems. Reiki the vibrational energy medicine when emitted through hands of Healer whose mind meditating on subtle love realms have the potential to relax, rejuvenate and renovate any human body and subtle bodies. This in turn throws away sickness and brings back wellness of body, mind and sprit. Even though Reiki improves serious medical condition, a competent healer and systematic way of treatment bestows complete healing. This Systematic way (from my 15 years of healing experience), healing positions, the conduct, ethic and life of healer are elaborately discussed in this book. Only a refined, dedicative healer have the capacity to create miracles in healing while other Reiki practitioners can pacify health symptoms. Reiki is an innovative healing technique, which has firm roots in Vedic & Tantric system, practiced thousands of centuries ago by the saints of ancient India. Equally it had closer links to the Buddhist practice that was flourished all over Asian subcontinent. 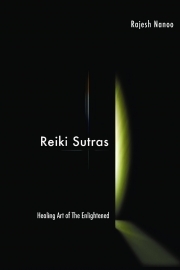 I have tried to explore and throw lights on the connection between the vital Reiki elements with Buddhist ideologies of energy awakening, which is lead by Tantric system practiced by Indian saints. The book contains subtle images, drawn by M. Vijayashankar and graphically designed by Myself and an elaboration of these 10 vital aspects. He was born and bought up in small village in Kerala/India in Jan 2 1974. After Academic studies, he lived his life completely on research. By plunging deeply into subtle philosophies (Upanishad, Zen, Sufism, Taoism, Buddhism, Kabbala), and Semitic philosophy (Judaism, Christianity, Islam) he gained insight. This background molded him to pen hundreds of poems, articles and studies, which are well known, appreciated worldwide through social networks. He also used to give lectures on the above-mentioned topics. He has acquired a Master Degree in holistic medicine (Reiki, Yoga, Herbalism, Naturopathy) and practiced as healer, trainer and counselor.